This sweet & sour chutney is an essential accompaniment to most chaats n snacks like samaosaa. cutlets or patties. Lemon skins dipped in tangy sauce made with lemon juice, sugar and spices. Sweet and sour mango achar which gets ready in minutes. Serve with daal chaval and enjoy it. 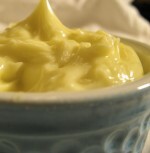 Basic recipe of Mayo using oil, egg and vinegar. A great way to add a new flavour to your plate without spending hours in the kitchen.